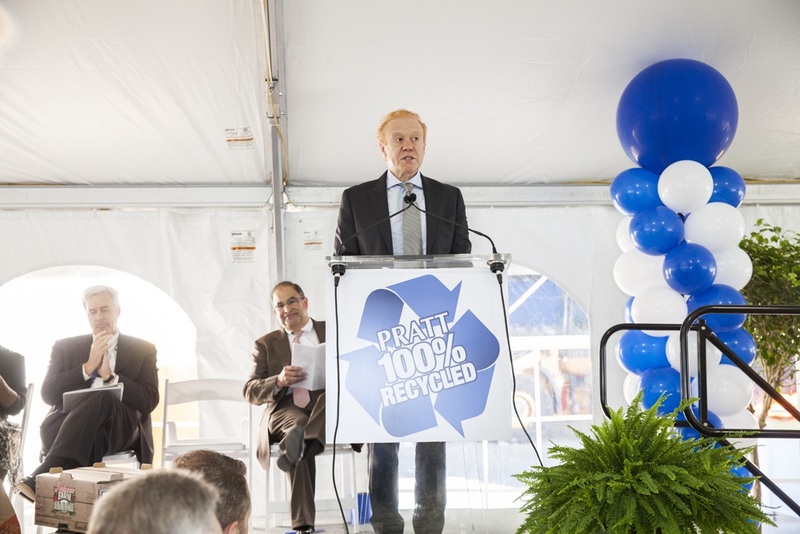 Pratt Industries, America’s 5th largest paper and packaging company, has officially opened its newest recycling Material Recovery Facility at its corporate eco-campus in Conyers, Georgia. The plant, which will receive materials from both municipal and commercial recycling programs, is the most advanced MRF in Georgia. It can process both residential and commercial single-stream recyclables, source-separated and baled materials. These include various grades of paper, plastic and metal as well as other materials. In 2013, the City of Conyers chose Pratt Recycling to be its residential and commercial waste services provider, as well as the recycler to service all households in the city, for single-stream recycling. At that time, Pratt built a municipal solid waste transfer station on the campus, the company’s first and the first for this area of Georgia. The newly opened MRF is the final phase of this project, and will help both Conyers and other Atlanta area municipalities and businesses greatly reduce their landfill costs as well as increase the recovery of recyclables. Company chairman Anthony Pratt said the MRF would process 10,500 tons of materials a month at capacity, including some 5000 tons of paper which will be used as fiber for the 100 percent recycled paper mill on site. That is the same amount of paper produced from more than 1 million trees a year. “And even the materials we can’t recycle can be used as fuel in our clean energy plant which is right next door,” he said. “We’ve been extremely successful in using landfill-bound material – instead of non-renewable energy – to power our paper mill and other parts of the eco-campus thanks to the high-tech stock prep systems we’ve put in place. Locating the recycling center on the campus now provides Pratt and its customers with a closed-loop recycling solution all on one site, including the MRF, the paper mill, a box manufacturing plant and the waste-to-energy gasification plant. The new MRF and transfer station occupy 90,000 square feet and feature some of the most advanced, hi-tech sorting equipment in the industry. All grades of paper collected and separated will be consumed as feedstock at the mill, eliminating the need for unnecessary baling, and will also save on transportation costs, ensuring a minimized carbon footprint for both Pratt and its customers. All metals, plastics and other materials will be sold to end-users of those commodities.